Vitor “The Phenom” Belfort made a name for himself in the early days of the UFC, beating fellow legends Randy Couture, Tank Abbot and Wanderlei Silva. After a long hiatus, Belfort made his recent return to the UFC and destroyed Rich Franklin at UFC 103. This fight demonstrated Belfort’s explosiveness and high level of striking, making him the top contender for Middleweight Champ Anderson Silva. 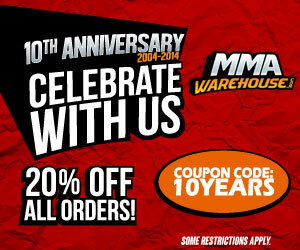 Belfort wore this jersey in his UFC 103 fight (see above). 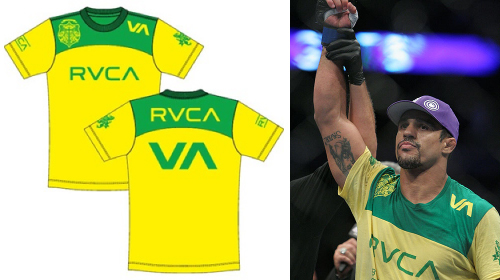 The Vitor Belfort Jersey is from RVCA and features the gold and green colors of the Brazilian flag. We absolutely love the designs that come from RVCA, their MMA t shirts have a fresh sporty style and the Vitor Belfort Jersey definitely looks great.